The legal troubles appear to be continuing for former UFC lightweight and featherweight champion Conor McGregor. According to The Mirror, the Irish MMA star is being accused of assaulting a fellow patron inside a bar called the Marble Arch in the Drimnagh suburb of his native Dublin, Ireland. The news was first reported by Dizz on Twitter. Surprise, surprise. I’m hearing some guy at the Marble Arch in Drimnagh, Ireland just got lit up by CM. Apparently CM was buying rounds of whiskey for the entire bar. Somebody shouted out something about him getting smashed by a Russian. CM walked up and lit him up. Per The Mirror’s report, this incident allegedly occurred on Saturday night, after Conor McGregor got into a verbal exchange with the victim. It’s been reported that somebody in the bar — it’s unclear if it was the victim or somebody else — told McGregor “The Russian battered you.” This comment, of course, is in reference to McGregor’s October loss to UFC lightweight champion Khabib Nurmagomedov. Gardai, the Irish police force, have confirmed they are investigating an alleged assault at the pub in question. McGregor has not been named as the perpetrator of the assault. 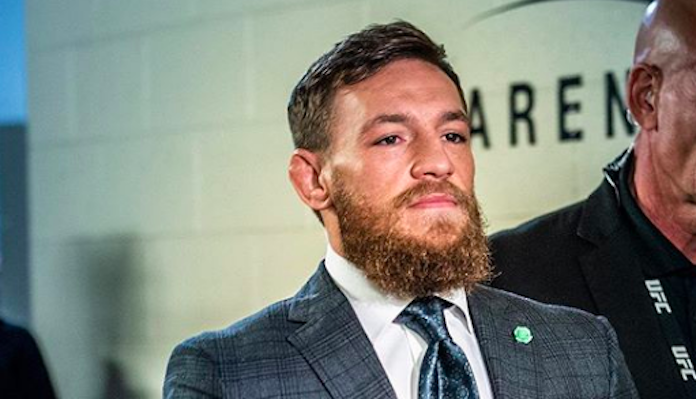 Amid a laundry list of legal troubles, Conor McGregor recently announced his retirement from MMA. He ended that retirement just days after it began, opening the door to a host of exciting matchups in the UFC lightweight division. While nothing is official just yet, it sounds as though he could return this summer, perhaps as soon as International Fight Week in July. Stay tuned for more updates on McGregor’s legal situation as details emerge.